Essential oils are everywhere these days–I see ads for new essential oil companies weekly. Even one of our local hardware stores carries a line of essential oils. It’s tempting to grab an easy, cheap eo purchase and hope to benefit. However, cheap oils readily available at the grocery (or hardware) store aren’t going to provide therapeutic benefits. If they won’t boost your health, they aren’t a good budget choice. 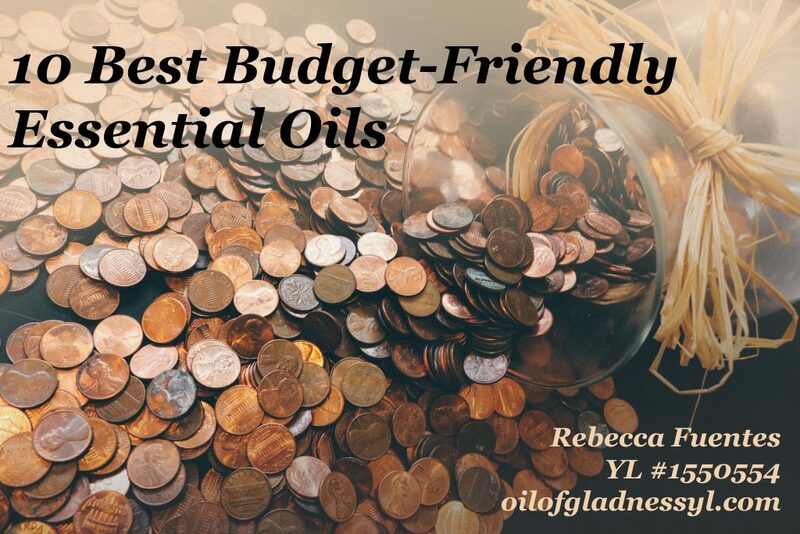 Unfortunately, many people on a budget feel that pure, grade-A, therapeutic-quality essential oils–Young Living’s Essential Oils–are simply out of their financial reach. Let’s face it, beneficial frankincense, sandalwood or rose oil can be budget busters. The good news? You don’t need expensive oils to benefit! What makes an oil a good budget oil? First, it has to be on the low end of the price spectrum. How about under $30 for a 15-ml? Some of these are under $20 for a 15-ml! Second, it has to have a wide variety of uses. The more things an oil can be used for, the better budgeting it is. Alton Brown love multi-taskers in his kitchen, and I love multi-taskers in my oil collection. Remember, an effective dose of essential oils is 1-3 drops. A 15-ml bottle contains approximately 250 drops! That means the most expensive oil on this list is still only $0.12/dose. The cheapest ones are less than a nickle per drop–pretty darn budget-friendly. Think top-quality essential oils are too expensive? Here’s 10 that are useful and affordable! Cedarwood: This oil comes in at a mere $11.25 wholesale. It’s a serious steal. Cedarwood in the diffuser creates a wonderful calming environment. It’s a favorite to diffuse at night here. Topically, it pampers and smooths skin and is a great addition to DIY beauty products. Hair loves cedarwood too, so use it for a great scalp massage, It can be added to a hot-oil treatment, to your shampoo or to your conditioner. What doesn’t love cedarwood? Outdoor pests! Apply to yourself, your children and your dog before a hike (dilute in a carrier for your dog). Melrose: Melrose is a blend of rosemary, tea tree, clove and niaouli essential oils. It clocks in at $19.75 wholesale, which makes me wonder why I put off ordering it for so long! Melrose has a wonderful, antiseptic-like scent. I know that doesn’t sound appealing, but to me, it’s such a clean, crisp scent. It’s great cleansing and purifying oil, so I use it in our foaming handsoap pumps. It’s a wonderful oil for skin, as well. Clove and rosemary are intense oils, so dilute the blend with a carrier oil (which makes it even more budget-friendly). I love a drop of Melrose in several drops of avocado oil rubbed into my hands. In the diffuser, it helps the whole house smell crisp and refreshing. Lemon: All the citrus oils could go on this list, but lemon is even on the cheaper end of those at $11.25 wholesale. As a vitality oil, add lemon oil to water for flavor and zing, or drip a few drops into cake or muffin batter in the place of lemon zest. As a non-vitality oil, it can de-gunk and de-grease, and is gentle enough for skin. Leftover band-air residue on the children’s legs? Lemon will take it right off, safely. In the diffuser, it fills the home with a refreshing, invigorating smell, perfect for mornings. We love to add it to laundry that has accidentally sat in the washer. A few drops in the second wash remove any mustiness. Elemi: This oil is related to both frankincense and myrrh, but it’s much more affordable. Often billed as “the poor man’s frankincense,” it only costs $21.25 wholesale. Like frankincense, elemi is excellent for helping your skin glow. It’s also great for general cellular health. Aromatically, elemi is good for emotional grounding and can be diffused during prayer or anytime calm and focus are needed. Lavender: For many people, lavender is the essential oil. It is widely used, well-known, and has been extensively studied. It is also quite affordable: only $23.50 wholesale. Lavender has one of the most complex molecular make-ups of any essential oil, making it one of the most useful and versatile oils you can have. Yes, it has a reputation for being calming and soothing–a great bedtime oil. The calming properties help keep a household (and classroom) running smoothly as well. It’s also an excellent oil for lovely skin, even skin that has been through tough times. It’s a great oil to apply or diffuse in the spring and fall. As a vitality oil, add it to recipes for a French flair. Tea Tree: Another well-know oil, tea tree oil is dynamite for keeping things clean. It costs $26.00 wholesale, and it well worth it. While it can be used in cleaning products or for spot cleaning in any area of the house, tea tree oil can also be applied topically to the body to support general health and wellness. Skin, nails and hair thrive with tea tree oil’s support, and diffusing it keeps the house smelling fresh and clean. I always keep tea tree oil on hand and apply it to my nails several times a week. Because it’s a powerful oil, dilute it (even more affordable, right?) for application to the skin or nails. En-R-Gee: En-R-Gee might not be the multi-takers other oils on this list are, but how many situations in our lives call for energy? It costs $24.75 wholesale–for energy in a bottle, that’s a great price. En-R-Gee can be diffused to reach the whole family, or it can be applied topically with a few drops of carrier oil for an individual pick-me-up. Try it as the afternoon blahs start to drag you down, or first thing in the morning when there’s no time for coffee. Put it on before a workout or an important meeting. Christmas Spirit: Most of us don’t think about Christmas Spirit until Black Friday. The Christmas tree and lights go up, the sales are on and suddenly we all want Christmas Spirit in the diffuser. When it’s available in a 15-ml, it’s $18.75 wholesale, though it’s more commonly available in 5-ml size (and sometimes, it’s a freebie). That’s cheap enough to use all year round–and you should! Christmas Spirit contains orange, cinnamon bark, and spruce oils. All three of these oils uplift and ground the emotions, something we all need. They are commonly used to relax and defuse tension. Rub it on your chest or feet for immune or emotional support–but use a carrier oil. Cinnamon bark is a hot oil! RC: After a long round of only being available in the 5-ml size, RC is finally available in the 15-ml again (for $22.75 wholesale–awesome)! A blend of three different species of eucalyptus oils, as well as myrtle, peppermint, and others, RC is the premier “breath right” essential oil blend. Diffuse it or apply it topically with a carrier oil before exercise, or at night for easy breathing till morning. We all need to breathe, and anything that can help is a great aid all through the day. Stress Away: Price-wise, Stress Away coming in just under our $30 wholesale mark, but I tell you, I won’t go a day without it. Stress Away is one of the most important oils for emotional support. In the world today, everyone is stressed out about everything. Arguments dog our Facebook walls; Twitter can be a stress IV, delivering bad vibes straight to our brain. Everything and everyone is in a hurry. Stress Away can help you handle all that! Whether it’s work, traffic, or parenting, it can help you stay on an even keel. Think you can’t afford real, quality essential oils? This line-up will give you emotional support, a pure, clean environment, restful slumber, and the get-up and go you need. With a wholesale membership, they are easily within reach (plus, that membership includes eleven oils, some of which are on this list already, and a diffuser). Not sure how to get that membership? Go to Youngliving.com, click to become a member, and put my member number in as both sponsor and enroller (1550554). Expect a welcome packet and a call to get you started right. You can do amazing things with Young Living Essential Oils, and it’s in your budget. Next Post Why Live Toxin-Free?